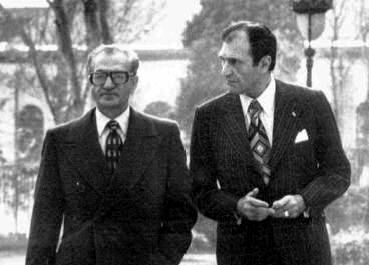 On the morning of January 15th, 1979, people heard rumor that the Shahanshah was planning to do something very important. The rumor was that "The Shahanshah is planning to leave the country". People have gathered in front of the Imperial palace to prevent the King's departure." The News Media did not have any Idea what story they have to run. They were not aware that people would rush to the Imperial palace preventing HIM from leaving. Media could not decide what to do without being sure of the news. At 5 pm on that same day, some media prepared sending their reporters to go on an important assignment. They even did not know what would be the nature of such assignment and location of it. People couldn't understand why they were kept in the dark. They suspected that it was either something to do with the latest taped message broadcasted of His Majesty or the expected vote of confidence for the Bakhtiar cabinet. On January 16th, reporters drove down to their respective offices but have had no Idea what to expect. In the early morning hours the streets were deserted except for a few people who as usual were shouting anti government slogans. At half-past-eight some reporters left for the Arya Hotel Sheraton. They were told that there maybe special assignment, that would be divulged at the hotel. At this hour street demonstrators were spreading. Reporters drove by passing groups of people anti carrying government banners, at this time they approached to the Sheraton Hotel where it was full of domestic and foreign journalists, skeptical of next moment preparing their microphone and cameras. Two buses idling in front of the hotel. A public relations officer from the Imperial Palace invited the journalists to board the buses. About 160 foreign journalists from around the world including photographers, cameramen, reporters, commentators and newspapermen were guided towards the buses. Nobody had idea where they were going, most of them had guessed that it was Mehrabad Airport. Over heard that the important assignment was to cover His Majesty's departure. Waited for a while following everyone on board of buses expecting to leave Hotel at anytime. None of these reporters has thought looking back at the events of recent months. The fooled nation and reporters looked at every scene like they came our of a movie theater. Suddenly a screams of a woman heard. The woman was well-dressed and well groomed. She threw herself into the bus and started telling the foreign reporters of the event of demonstrations on the streets. Moments later the same lady who seemed to be from the Ministry of Court's public relations office returned to tell us in English that the trip to the airport was off. All foreign reporters and journalists got off the buses. The same lady approached one of the Iranian reporters whispering and asking him to follow her. روزی که برای خروج از کشور به فرودگاه رفتیم، تیمسار قره باغی آمد جلوی هلیکوپتر و ادای احترام کرد. سپس ژنــرال بدره ای جلو آمد و من و شاه را بوسید. شاه به ارتشبُد قره باغی و ژنرال بدره ای، ژنرال خسرو داد، ژنرال ربیعی و افسران عالی رُتبه حاضر در پاویون سلطنتی گفت: "ما برای مدت کوتاهی استراحت میکنیم تا ببینیم چه میشود؟"
افسران حاضر مثل بچه های کوچک، گریه میکردند. ربیعی، فرمانده نیروی هوایی دستِ شاه را گرفته بود و رها نمیکرد. عده ای خود را روی پای شاه انداخته بودند. شاه به عنوان آخرین دستورات به آنها گفت: "ما در این شرایط احتیاج به نهایتِ میهن پرستی شما داریم." قره باغی با صدایِ بلند گفت: اعلیحضرت چه دستور میدهند؟ شاه گفت: "ابتکار عمل به دست خود شما است، همان که گفتم احتیاج به میهن پرستی در نهایت معنی آن داریم؛ امیدواریم خودتان را نشان دهید."